A rectangular kesi tapestry panel depicting figures in a landscape setting. The upper section of the panel shows a man in traditional Chinese dress and a deer’s skin, which covers his back. He is depicted in a half-kneeling posture, with his hands clenched in fists and a pail in front of him. A deer runs past him, whilst another deer is half seen, having run into the mountains. The lower section of the panel, which is separated from the top half by a river, depicts two hunters in motion. They are engaged in conversation, seemingly discussing how to hunt the deer. The front figure holds a bow and arrow in his hands, the other has a trident on his shoulder and points his left finger towards the deer. The scene is contained in a rectangular cartouche, with a dark blue band around it, which is adorned with plum blossoms and peonies. Kesi means “cut silk”. The earliest surviving examples of kesi date from the Tang dynasty (618–907), but it first became widely used during the Southern Song period (1127–1279). The technique became particularly popular during the Ming period (1368–1644) and thrived until the end of the Qing dynasty in 1911/12. The kesi technique was often used to copy famous paintings. 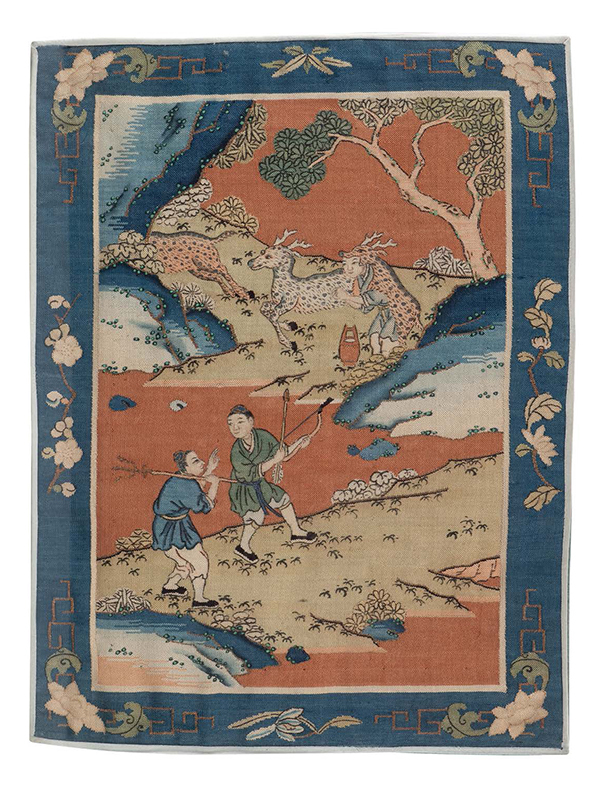 This well-preserved kesi tapestry panel tells a filial story, known as ‘feeding the parents with doe’s milk’, which was popular in China from the Yuan dynasty (1260 – 1368). Tan Zi, living at the time of the Spring and Autumn period (771 to 476 BC), covered himself with a deer’s skin to get close to a doe to obtain its milk for his parents, who were losing their sense of sight. The doe’s milk was believed to be able to cure them. He repeated the process every day. Once a hunter mistook him for a real deer and almost killed him, but Tan Zi revealed himself and explained the situation to the hunter. This story is included in The Twenty-four Filial Exemplars (Ershisi Xiao), a classic text of Confucian filial piety written by Guo Jujing during the Yuan dynasty. The text was extremely influential in medieval China and was used to teach Confucian moral values. Paintings depicting this story were executed by famous artists, such as Qiu Ying (1494 – 1552) whose work is in the collection of the National Palace Museum, Taipei.